Australia has more deadly wildlife than another other continent – you’ve got to watch out both on the land and the sea. As a friend said to me when we first arrived in Australia, “treat everything as if it can kill you”. Kakadu National Park is distinct in Australia because there is a possibility to experience wildlife such as crocodiles and also ancient Aborigine Art that is at least 40,000 years old. Kakadu National Park is by far the largest national park in Australia and is half the size of Switzerland. This means that it is best to dedicate at least a week to this park in order to experience everything that it has to offer tourists. If you are looking for a national park that looks spectacular by air and has a lot of four-wheel driving, then Purnululu National Park is the ideal choice for your holiday. The sandstone rocks that exist in Purnululu National Park are amoung some of the largest in the world. For hikers and campers, the park is full of wonderful places, but bear in mind, there is no food available easily in the park and individuals need to plan what they will be eating before arrival. Freycinet National Park is actually the oldest park in Tasmania. It is famous for the Hazards, which are pink and red mountains made of granite. Wineglass Bay is stunning and has one of the best beaches in Australia. The park has Aborigine roots and also has some parts that have yet to be discovered. For those that enjoy fishing, beachcombing, and water sports, Freycinet National Park is a great place to visit. Uluru-Kata Tjuta National Park is a park known for its lone mountain range formation that is independent from the main mountains. The rock formation serves as a spiritual symbol for the region’s aboriginal peoples. Part of the rock formation called Kata Tjuta possesses 32 different rock dunes. For travellers, the photographs here of sunrise and sunset along with the incredible spiritual energy are absolutely worth the trip. Kosciuszko National Park is located in Southern New South Wales. The park is famous for its mountains and even has the tallest mountain in Australia called Mount Kosciuszko. Additionally, the park is home to the highest town, which is called Cabramurra. The lands of Kosciuszko National Park have been home to Aborigines for 20,000 years and is the only place where the Southern Corroboree Frog can be seen. Kosciuszko National Park offers four seasons of enjoyable activities and is wonderful for tourists. Kangaroo: The Kangaroo is a well-known symbol of Australia. In fact, there is a larger estimated kangaroo population than human population in Australia. The animal is famous for its pouch that it uses to carry its young and hop around Australia. Kangaroos are also known to be the largest surviving marsupial in the world. Echidna: The Echidna is one of the rarest animals in the world. It is a spiny anteater that is also an egg-laying mammal. The Echidna has sharp spines that it uses as protection from predators. The Echidna is also special in the sense that it is one of the last surviving members of the monotreme species. Koala: Another popular symbol of Australian identity is absolutely the Koala. Koalas are animals that reside in trees and are actually native to Australia. Mainly, they are located in the coastal areas of Queensland and Victoria. Currently, Koalas are a vulnerable species because there has been a surge in hunting and destruction in Australia’s natural areas. Wombat: Wombats are another animal that is native to Australia. They primarily reside in the mountainous terrain that Australia possesses. Wombats are best found in the Epping Forest National Park. Here, it is one of the best spots to see wombats peacefully in their natural habitat. Platypus: The Platypus is another animal very distinct to Australia that is actually egg-laying. They are a semiaquatic animal and typically keep to a mix of water areas and marshes. The Platypus species itself is a combination of the beaver, duck; however, it also has venom that it can release to potential predators. Thorny Dragon: The Thorny Dragon is a species that can be found in the more desert parts of Australia. It is the only species of devil lizard found in Australia. Even though the Thorny Dragon is a small species of lizard, it is known for its spikes having a major impact against predators. Tasmanian Devil: The Tasmanian Devil is one of the animals in Australia that has quite the famous reputation. The reason for this is that the Tasmanian Devil has been featured in many famous Looney Toons cartoons over the years. The Tasmanian Devil is typically found in the wild forest of the Australian Island, Tasmania. The Tasmanian Devil have a very strong bite and are known as having the strongest bite per body mass unit than any other land predator. 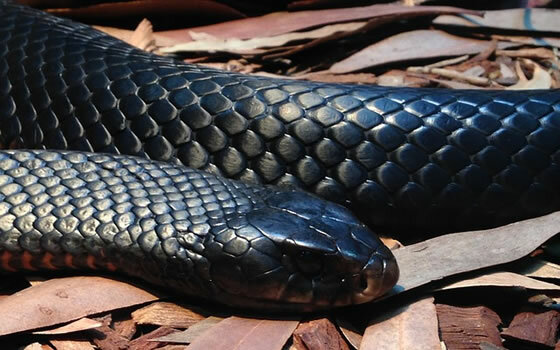 Inland Taipan: An alarming statistic is that most of the snakes in Australia are deadly! The Inland Taipan is the world’s most venomous land snake. The Inland Taipan lives in regions of central and east Australia. The venom that is inside the Inland Taipan is one of the most toxic in the world. This is why it is imperative to stay far away from snakes in Australia as they may be quite dangerous to deal with! Dingo: The Dingo is Australia’s wild dog and it is an entirely separate species from a dog that is found in both the desserts and the grasslands of Australia. The Dingo is currently considered as the largest predator in the country, but that is also currently endangered and on the verge of being extinct. Australians are quite proud of the Dingo and have taken rigorous efforts to protect the species. Goanna: The Goanna is quite the impressive lizard in terms of size. The Goanna is the fourth-largest living lizard found on the planet. In order to see one of these lizards, it is best to venture to the desert areas of Western Australia in order to have a peek. Are the Wild Animals Shy Towards Humans in Australia? Currently, there are mixed feelings amoung travellers regarding whether animals in Australia are actually friendly towards humans. There are indeed some animals that can be quite friendly and not deadly for tourists to encounter. The key is to be cautious in the Outback part of Australia as many of the animal species are quite unique and possibly, deadly. Some examples of animals that are friendly are the wombat, wallaby, pygmy possum, kangaroos, and koalas. Australia really does have some of the most impressive and truly special wildlife in the world. The key to any adventure traveller having an enjoyable experience is going to be related to how they protect and educate themselves about Australia’s animal species. More often than not, Australia’s animal species can be quite harmful and poisonous. This is particularly true in the rural parts of Australia. This is why it is best to hire a guide in order to avoid being harmed by a species that you did not even know existed before you decided to visit Australia. Once you take the time to properly learn about the various animal species, you will be able to enjoy seeing them in their naturally habitats and be safe at the same time. Be sure to take time to visit the national parks and wildlife in Australia because it will be a remarkable experience.